Essential 10 Meal Replacement contains a complete plant-based protein-rich meal with healthy fats, carbs, fiber and the equivalent antioxidant value of 10 servings of fruits & veggies in every serving. 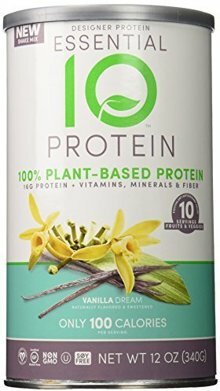 Essential 10 Meal Replacement with the antioxidant equivalent of 10 servings of fruits & veggies is a delicious all-in one protein-rich meal that is quick and easy to make. 22g of natural, soy-free, non-GMO plant proteins satisfy hunger and help support body tone. Healthy vegetable-based fats help support LDL cholesterol levels and healthy carbs provide a steady flow of energy. 21 vitamins and minerals support vitality and energy metabolism. Prebiotic fiber, probiotics and digestive enzymes curb hunger and support digestive health. Certified vegan, gluten-free, and kosher, this soy-free, dairy-free, non-GMO meal replacement with no artificial flavors, sweeteners, colors or preservatives provides clean, balanced nutrition every time.